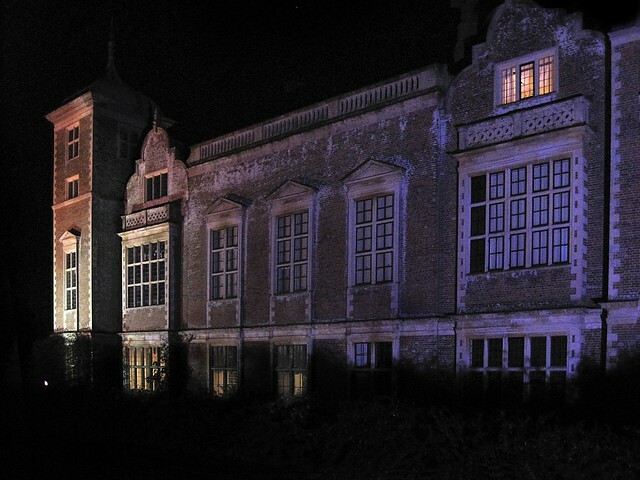 For a county that’s so steeped in history, it’s not surprising that Norfolk has its fair share of ghost sightings and paranormal activity. 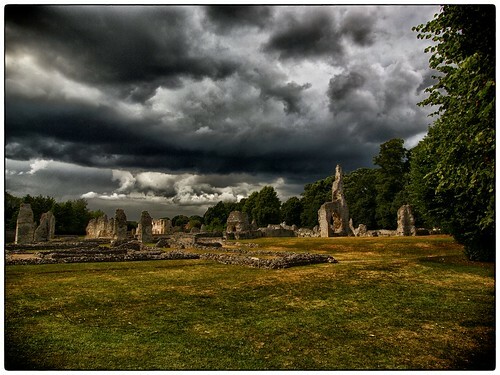 We have gathered an unlucky 13 legendary haunted places to visit if you dare! 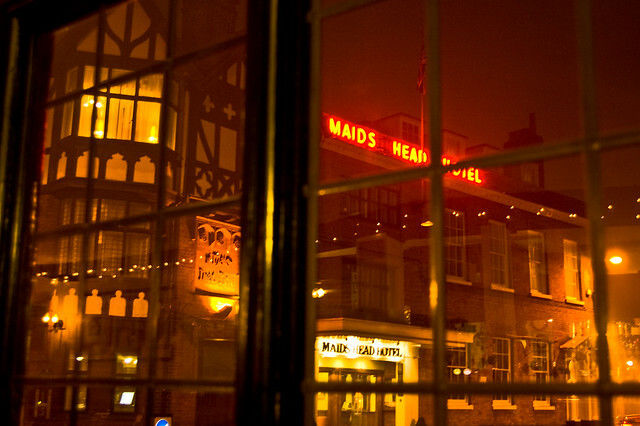 Located in the picturesque Tombland in the fine city of Norwich is The Maids Head Hotel that claims to be the oldest hotel in Britain, at over 800 years old. Even Queen Elizabeth I was reportedly a fan, spending the night in what has now been called the Queen Elizabeth Suite during a stay in the late 16th century. The Tudor style hotel is supposedly home to a maid who floats around the corridors with a strong smell of lavender following her. A second phantom is that of a former city mayor who has been sighted in the courtyard violently shaking his head. Dubbed the “she-wolf of France”, Queen Isabella bought Castle Rising Castle in 1330 and lived there until 1358. The castle itself was built by Earl of Arundel William d’Aubigny II in the 1100s and was once a resplendent residence for very important people and much of the former splendour and surrounding earthworks remain to this day. Rooms in the building are reported to be haunted by the Queen, with people supposedly hearing the “swishing” noises of her dress as she passes or even her cackling laughter reverberating around the castle. More sinister still is that Isabella is reported to have been involved in the murder of Edward II in 1327. Reports of hearing the monks chanting and singing in Latin have been documented as early as the 1930s. With other nearby spots that purportedly play host to ghouls and ghosts such as the Warren Lodge and Grimes Graves, this is a hub of paranormal activity. The television programme Ghosthunters also featured the ruins in an episode. The beautiful listed pier in Cromer is a hub of activity during the summer months – think ice creams, fish and chips and seagulls. But when the colder months come creeping in, the old place reveals a more sinister side. 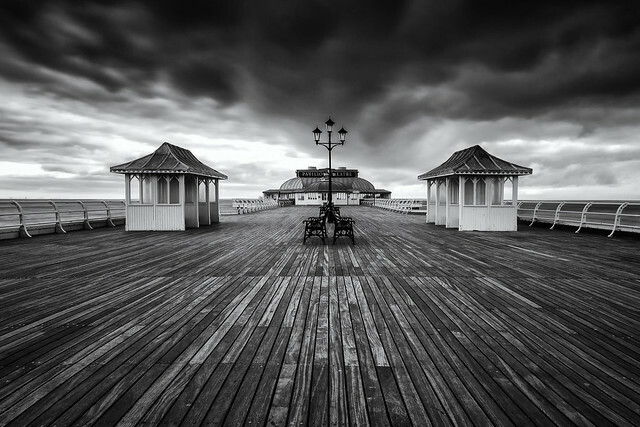 The Pavilion Theatre - located on the pier - is supposedly haunted by ghosts seen by performers that appear on stage next to them. Theatre goers have also reported sightings of a man with a tall black hat and poltergeist activity too. There have also been sightings of a phantom island across the sea, supposedly the lost town of Shipden. The iconic castle – founded by William the Conqueror – that stands proudly overlooking Norwich is steeped in a bloody history so it’s hardly surprising that a few angry souls remain, haunting the 900-year-old keep. Aside from the fact that nearly a hundred homes were demolished for its construction, the castle was also used as a place of imprisonment and execution. Ghost sightings include the decomposing remains of Robert Kett, hanging from the castle in a cage. Reports of another ghost, that of a black clothed woman, have been made since at least 1820 and are still noted to this day in the art gallery. If you visit the Grade I lis ted mid 17th century Scole Inn in Diss you may hear the sound of galloping phantom hooves. A highwayman is the ghost that resides here, whose horse can be heard galloping through the inn, trying to escape from the authorities. Another sinister ghoulish visitor is Emma, a young girl who was violently killed by her husband in a jealous rage. Her bloody apparition has been spotted by horrified visitors since the 18th century. The childhood home of Anne Boleyn, Blickling Hall is the grand country house that is said to play host to the decapitated body of the famous wife of Henry VIII who was executed in 1536. After the King lost interest in Anne, she quickly came under the scrutiny of powerful disgruntled figures who blamed her for driving him away from the church. This eventually resulted in her execution for adultery and treason. Is it any wonder her angry spirit is spotted every year on the anniversary of her death? Dating back as far as 1249, this inn on Bishopgate is said to be one of the oldest pubs in Norwich. If you fancy a drink, you might have the company of the ghost of Lord Sheffield, a nobleman who was caught up in Kett’s Rebellion in 1549 before being stabbed and dragged to the former inn on the site of the Adam & Eve, where he died. A zealous priest called Father Ignatius is said to haunt the cobbled Elm Hill in Norwich. He is thought to have cursed those that didn’t engage in prayer way back in 1864, eventually inciting an angry mob of superstitious townspeople to drive him out of the city. His vengeful spirit is said to have returned and curses passersby to this day. There is a separate ghoul that supposedly died in a fire whose footsteps can be heard walking around one of the houses on the street. 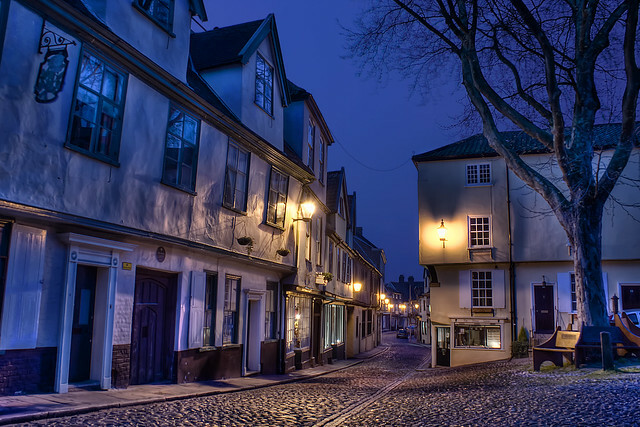 People have also had strange encounters with disembodied footsteps clomping around the antique shop on Elm Hill. 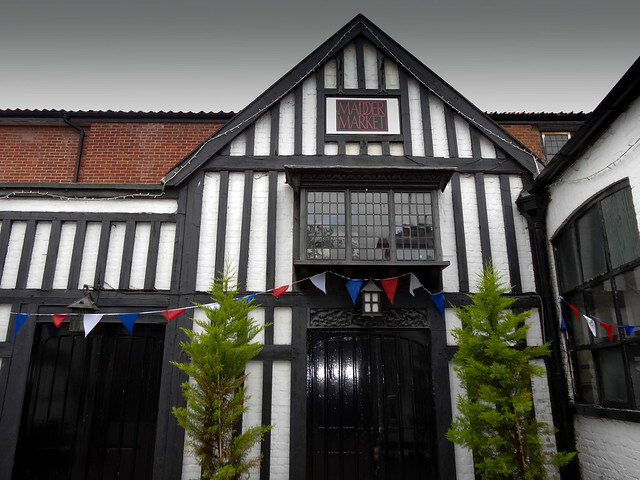 The popular Maddermarket Theatre is actually located on the site of an old Roman Catholic Church and is supposedly haunted by a monk seen walking from one of the reclaimed confessional boxes and across the stage. He has also been sighted in the cobbled alleyway that runs up to the theatre. Far from evil, this spirit has supposedly saved someone’s life who was about to be struck by a falling light and even comforted actors who forgot lines or mess up their parts. The ghost of The Brown Lady of Raynham Hall is supposedly that of Lady Dorothy Walpole who was locked in a room of the hall after her husband, Charles Townshend, learned that she was having an extramarital affair. She was even withheld from seeing her own children and now her unkempt spirit manifests wearing an old brown dress. She died of smallpox in 1726 and has been spotted floating around Raynham many times throughout the centuries since her grisly demise. The photograph below was published in a 1936 issue of Country Life magazine by one of the publication’s photographers during a visit. 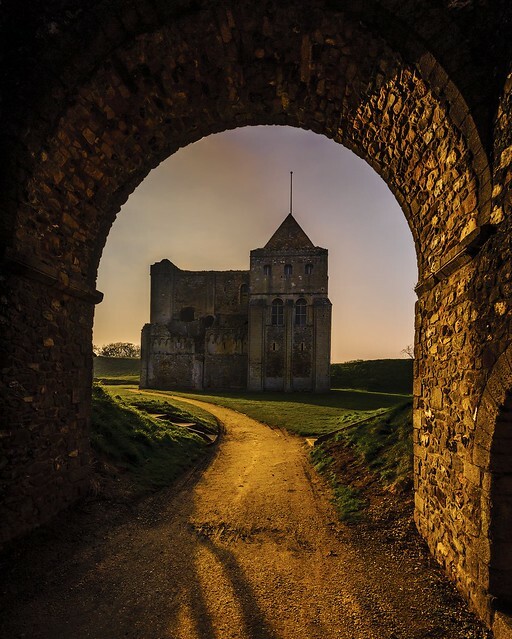 The tunnels near Binham Priory are supposed to be haunted by a local fiddler, Jimmy Griggs, who went to investigate the tunnels after they partially collapsed during a storm. He entered the tunnel with his pet dog yet hours later only the pooch would emerge. The tunnels then collapsed completely with Griggs still inside and he was never seen again. All these years later, eerie music can still sometimes be heard coming from the disused tunnels. Could it be Jimmy playing his fiddle? 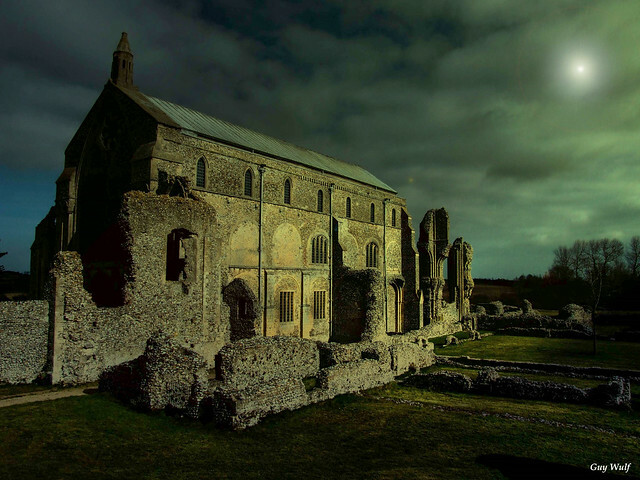 There have also been reports of ghoulish monks traversing the tunnels linking the priory and the holy shrine in the nearby village of Walsingham. The market town of King’s Lynn has many pretty streets and historical buildings but one street, now come to be known as Devil’s Alley, has a more sinister side. There used to be a mark in the cobbled alleyway that, according to legend, is the spot where the Devil himself stamped his hoof after a priest came upon him and banished him in a dramatic fury. The print has since disappeared but an eerie presence still remains.